Salvador Perez stepped up to bat in the 12 inning, he had struggled the entire game going 0-5 with two strikeouts. He struck out in the eighth with runners on second and third and one out, he also grounded out with a runner on third and the game tied in the tenth. But, this at bat was different it had been almost five hours since the first pitch. The Royals had just tied the game back up after Eric Hosmer hit a triple off the left field fence, and Christian Colon drove him in on a dribbler to third. Colon than stole second, this gets us back to Perez. Two outs runner on second with a 2-2 count and Perez with an at bat you can only dream of, and he ropes a hard-line drive right off third baseman Josh Donaldson glove to score the game winning run. If your like me you thought this game would be a low scoring game with great pitching, I was wrong. It was arguably the greatest game I’ve ever seen, and will more than likely go down as the game of the year. 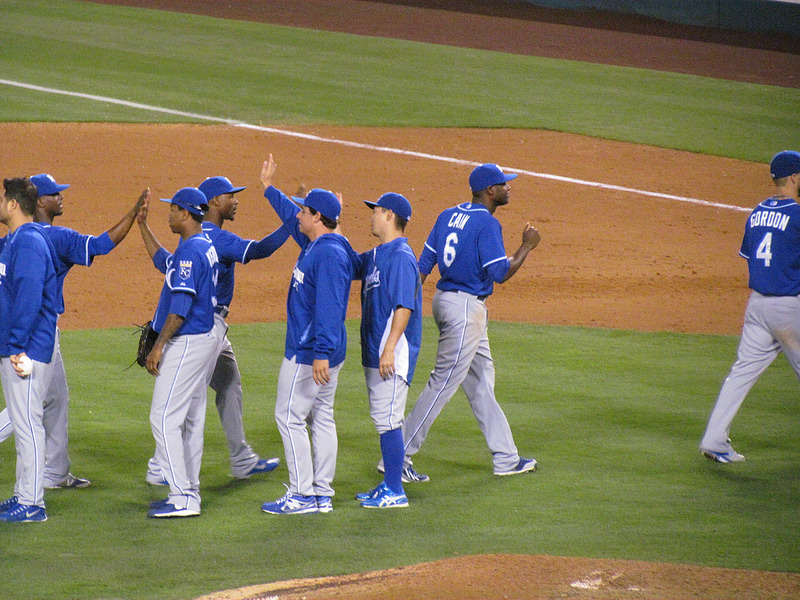 The game lasted almost five hours, saw five lead changes, and seven stolen bases by the Royals. The Oakland A’s got off to a quick start in the first inning with a 2-0 lead on a two run home run by Brandon Moss. Kansas City responded with a run in the bottom of the inning, on a single from Billy Butler, driving Norichika Aoki in to make it a 2-1 ball game. 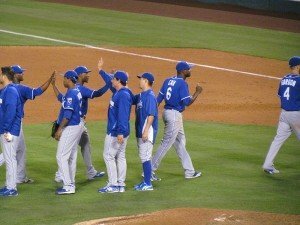 The Royals would go on to score two more runs in the bottom of the third to take the lead 3-2. The A’s would go on to score five runs in the sixth inning to take a 7-3 lead and it would stay that way till the bottom of the eighth. Kansas City came into the eighth trailing by four runs, and looking defeat in the eyes. The Royals where able to play small ball and score three runs, they had three stolen bases in the inning to make it a 7-6. They shut the A’s down in the top of the ninth and yet again played small ball. Josh Willingham singled to right, than the Royals put Jarrod Dyson in the game to pinch run. I said before the game that they key would be the speed of the Royals, and that definitely played a huge roll in the game. Dyson than moved up to second on a sacrifice bunt by Alcides Escobar, after advancing to second, Dyson had the play of the game. He was able to steal third on one of the most riskiest plays in the game. Aoki hit a sacrifice fly to right field to drive Dyson in and tie up the game at 7-7, and send the game to extras. The game remained tied till the top of the 12th when pinch hitter Alberto Callaspo, drove Josh Reddick in to give them the lead. Now all Oakland has to do is get three outs, easy right? Nope, not against the resilient Royals and you know what happens next. Brandon Moss had a big game for Oakland with two home runs and five RBIs, but that somehow still wasn’t enough. The A’s did make a mistake by letting Jon Lester go out in pitch in the eight and I think that ultimately cost them the game. The Royals had seven stolen bases by seven different players, and didn’t hit a home run. I see a very dangerous team in Kansas City, not many teams can play small ball like them and this team is hungry. My player of the game is Eric Hosmer, he was 3-4 with a triple and two RBIs, and you saw the hustle in Hosmer when he did a head first slide into first base. Hosmer clutch triple and the 12th and his ability to get his team to rally around him will be a key for the Royals moving forward. The Royals will travel to play the Los Angeles Angels on Thursday, the game is on TBS, the game time has to been decided. Jared Weaver (18-9) will be on the mound for the Angels, while the Royals haven’t announced who will pitch for them yet.